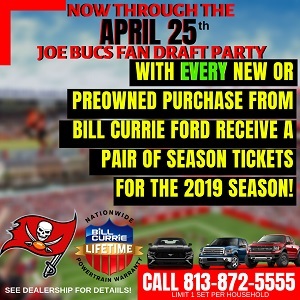 Rather than listen to national pundits talk endlessly about how Ryan Fitzpatrick will soon show his true colors with a brutal turnover-filled peformance, Joe is taking a more optimistic view. So Joe asked Fitzpatrick today how good he is at his point in his career, specifically the fit for him in the Bucs offense. The verbatim exchange is below. Quite an answer from the level-headed, 35-year-old Fitzpatrick. He thinks he is better than ever — whether anyone likes it or not. JoeBucsFan.com: Ryan, do you feel like this offense, after all the places you’ve been and the talent that’s here, that it really suits you? That maybe you’re kind of coming into your prime and this is the right place for you? Ryan Fitzpatrick: Every stop for me has been different. Every offense has been different, some tailored to my strengths, others I’ve just kind of had to fit in. But, you know, I think the places where I’ve done well they’re able to play at the line of scrimmage a little bit, you’ve got some veteran guys on the outside, that kind of understand the game and can take the next step in terms of what we’re trying to do [as an offense]. And also, I think all the different experiences I’ve had, I just continue to become a better player whether people think that or see that or not. You know I’m better right now than I’ve been at any point in my career and lot of that is mentally and whatever else. But there’s a lot of different throws and things that are so much ingrained in you, so much muscle memory from working and doing it for a long time. Truly I feel like the older I’ve gotten the better I’ve become. The fun thing for Fitzpatrick is he gets a chance to prove it, whereas most journeyman like him don’t get to train all summer as the No. 1 quarterback and get three guaranteed starts against stud teams. As Joe has written, Fitzpatrick is 21-20 as a starter since the start of the 2014 season, including 3-1 as a Bucs starter. That’s not a coincidence. That doesn’t mean he’s better than Jameis Winston, America’s Quarterback, but there’s no reason to cast Fitzpatrick as a scrub who had a fluke lucky day Sunday. Plus I don’t think Fitz has ever had this kind of offensive talent around him before. Hope he win another one on Sunday. Jameis trade to Oakland for Derek Carr and one of the #1’s Raiders just got for Mack. get it done right after suspension lifts, Bucs on bye week, Fitz stays in place until Carr is ready. Mccarron plays a week until Jameis is ready. He’s always played on sh#tty teams, until now. Steve Young could tell you about the difference when you go to a talented team. Fitz has always been solid imo. When he’s had good casts around him he’s put up good #’s. All our QBs looked good in preseason. I think Winston had the best #’s of them all and looked dialed in. He outplayed Fitz in 2017. I still think that’s who starts for us week 5 at worst; but if we are 4-0 and Fitz is lighting sh1t up then don’t mess with it. “Fitz has never had this kind’ve talent around him” Am I the only one who remembers him playing in the Dome last year??? Thought it was pretty obvious that the lack of Dirk’s predictable trash calls were the main difference. It makes sense that he continues to get better. He’s 35 but a well preserved 35, not playing too much but still getting practice reps, mental reps, and a decent number of starts through the years. I’ve seen stranger journeyman to star transformations, Rich Gannon was drafted by the Pats out of Delaware back in the late 80’s early 90’s. They wanted him to play safety but he refused. He wound up with the Vikings, played for a few other teams and didn’t look nearly as good as Fitz has at several points in his career. They have similar games. Gannon is faster than FItz, Fitz is more willing to use his legs for yardage. Both don’t have great arms, Gannon a little more accurate…. not saying it will happen but Fitz could be an all pro. He just has to stay hot and healthy. He’s got the physical tools, has the smarts, and definitely has the offensive weapons. @gary: Coach Gruden did not take the job in Tampa Bay because JW was the quarterback. To that end, why in the world would you think he would want to trade Carr for JW. ****big news about JW coming right before his suspension ends. Mark my words. Here are some facts for the FSU snowflakes. Fitzpatrick had three touchdown passes against the Saints that went for 30-plus yards in the air. He attempted just four of those types of passes, and all three completions were for scores. Last season, Jameis Winston was just 3 for 20 on such attempts, throwing for just two touchdowns and one interception. While it may be too early to say that Fitzpatrick will continue this hot streak, the Bucs may have no choice but to stick with the grizzled veteran if he leads the Bucs to a 3-0 or even 2-1 start. 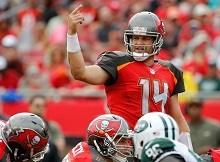 He’s proven he can lead a team, and given Winston’s inconsistent play at the position, Fitzpatrick could be the missing piece to get Tampa Bay back to the postseason. Everybody said this and that about the guy. Said he’s a career backup and we would be lucky to win one of our first three with Ryan. Well that win wasn’t luck ladies and gentlemen. Just put yourself in Fitzpatrick’s shoes. Do you really think he was going to approach these three games as a fill-in player? Heck no!!! These three games represent an opportunity for Fitz. Whether or not he succeeds he is going to prepare and play the best football he can to prove he can be a starter in this league. Good football players are competitive and these three games are a big challenge. Ryan Fitzpatrick showed all of us how hard he is going to fight for our team and town he was an absolute warrior last Sunday!!!!!!! Thanks Ryan for giving us everything you got man!!! Todd Monken called a great game against the Saints defense. I have always said that playcalling was as important as a team talent. And my personal thoughts on Winston(because I know you all care what I think). He’s on the back burner right now. Sorry guy, I still love ya but you couldn’t be here for us and Fitz has taken great control of this offense. Unless Fitz loses it you are going to have to stay on the back burner. If Fitz keeps this offense humming and Winston does have to take a backseat it will tell us a lot about Jamies’ charchter to see how he handles it. BTW, that’s the beauty of having just about any highly experienced QB like Drew Brees, Tom Brady or Peyton Manning on the field IMO. It’s that FIELD GENERALSHIP that you can’t really teach as far as I’m concerned … it takes time for QBs to develop that, and it can only be perfected while the bullets are really flying so to speak. And coincidentally, there are usually a LOT of MISTAKES made along the way. Fitz did a beautiful job of explaining what that journey involves IMO. Kudos Joe on a great article. A couple of things , Montgen agressive playcalling was part of the gameplan necessary to stay with New Orleans. Agree with your baseline statement, but struggles with the deep ball and too many turnovers are things that can not be blamed on Koetter. and take the short runs necessary to have manageable 3 rd downs. Can you imagine how much fun Fitz had last Sunday? Being in the zone and knowing it…just feeling it….he KNEW what was going to happen…the look on his face we he ran it in from three yards…he just knew what kind of day it was going to be and he would be a big part of it. …in two games or less, you’ll all want Jameis back….